By downloading this software, you agree to our Terms & Conditions. Download the latest installation package (currently ts12sp1, v1.4.1.9). Install the package to an empty folder somewhere that you can remember e.g. on your desktop. Be sure to create a subfolder specially for the installation, and give it a useful name like "RailDriver TANE". Do not install the package to your TANE install folder! On completion, the calibration tool should run automatically and show the RailDriver Calibration tool. Copy the calibration file (modern.rdm) to this subfolder, replacing the existing modern.rdm file. Start TANE and open the "Trainz Settings" from the launcher (the first visible window). Check if the "Enable controller support" setting is on. If it is not, turn it on now. Close the settings window and click "Start Trainz" then your RailDriver device will ready for use in TANE. Simply open up your favourite route, and enjoy. Note that DCC/Simple and Cab/Realistic still have different control modes, even on your RailDriver device. The RailDriver controller does not function in Trainz, or the status window on the controller just shows "rd." 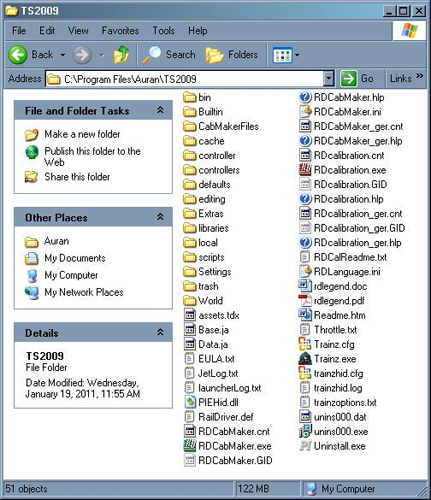 If you don�t have all of these folders and folders in the same location, run rdts2009u.exe again and double check your installation path. I have Trainz 12 SP1 and some of the controls on the RailDriver do not work. Please update your installation to the latest version intended specifically for Trainz 12 SP1. No matter how many times I calibrate, the levers don't match the information in Trainz. First, check in the ’controller’ folder for the Modern.rdm file, and the ’controllers’ folder for ModernCalibration.rdm. Both of these files should be in their respective locations, and the Date Modified lines should match. If these 2 dates do not match, you will need to make a copy of the ModernCalibration.rdm file and rename it to Modern.rdm and place this in the ’controller’ folder. This problem is most common when Trainz is not installed on the default C:\ Drive and on some Windows 7 setups. All of the levers work well, but I’m having a hard time getting the throttle to reach 8. To fix this, you will need to run RDcalibration.exe again, but when calibrating the throttle and you reach the very top/bottom for calibration, move the lever away from the end just a bit. This will give you a bigger window for the 8th throttle notch instead of a single point. In Trainz 2009 or 2010, the reverser and throttle levers don�t work when driving a steam engine, but the brakes and buttons function. This is a known issue and is on our list of projects to revisit. There was a change to the commands for these levers shortly before Trainz 2009 was released and we already had our software finished at that point. We will be looking into this and updating the installer again in the near future. When running a train in DCC mode, the RailDriver isn’t as accurate as using a mouse. The RailDriver wasn’t designed with DCC mode in mind. While it does work in DCC mode, it functions a bit differently than mouse control and takes some getting used to. Our tech support department would be glad to answer any questions you may have! Just call us at 1-800-628-3185 ex. 19 (Monday through Friday, 8AM - 5PM eastern time), or e-mail us at tech@piengineering.com.